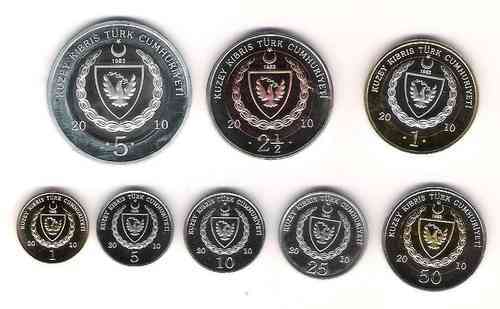 We will send an email to as soon as the product Northern Cyprus 8 coins set 2010 is available. Northern Cyprus, also known as the Turkish Republic of Northern Cyprus, is a de facto independent state, located in the northern portion of the Mediterranean island of Cyprus. This republic declared its unilateral independence in 1983, nine years after a Greek Cypriot coup attempting to annex the island to Greece triggered a Turkish invasion of Cyprus. Northern Cyprus has received diplomatic recognition only from Turkey, upon which it is dependent for economic, political and military support. The rest of the international community, including the United Nations and the European Union, recognises the de jure sovereignty of the Republic of Cyprus over the entire island. Attempts to reach a solution to the dispute have so far been unsuccessful. The Turkish Army maintains a large force in Northern Cyprus; its presence is supported and approved by the de facto local government, but the Republic of Cyprus and the international community regard it as an illegal occupation force, and its presence has also been denounced in several United Nations Security Council resolutions. Northern Cyprus extends from the tip of the Karpass Peninsula in the northeast, westward to Morphou Bay and Cape Kormakitis, and southward to the village of Louroujina. A buffer zone under the control of the United Nations stretches between Northern Cyprus and the rest of the island and divides Nicosia, the island's largest city and capital of both states.